Last year I ignored the offseason thread because I don't know what any of your abbreviations and fancy terms mean, and only know a handful of player names outside of the Philadelphia Eagles. This time I'm going to be a passive observer and see if I can actually learn anything. The only part of the Superbowl worth watching was the Bud Knight getting murdered. Sources say the Nick Foles stuff is happening: Eagles expected to pick up Foles' option, Foles expected to void the option (paying back $2m to the team), Eagles then expected to franchise Foles and look for a trade partner. Boring Bowl, the morning after. The top post on the Jaguars subreddit: "Now the world knows what it’s like to watch Jags games." I quite liked it, sure it didn't end up a million points each but it was good to watch two defenses on top for a change. Yeah, I didn't think it was awful, but I spent most of the time trying to see how much press coverage the Rams were doing while also pretty much only watching Aaron Donald. I was attempting to watch the Rams O for certain things, but I'm not sure they ever arrived at the stadium, especially the OL which was continually getting beat by the same stunt moves that kicked their asses in the latter half of the regular season. Julian Edelman was suspended four games to start the season for PEDs. He then wins MVP. What's the lesson here? Taking a month off helps you stay healthy for a playoff run? Cause that's the lesson I learned following Deflategate and Brady's suspension and here we are again. I would have liked it better if some of the defensive play wasn't just feasting on offensive ineptitude. The Rams offense just didn't show up. They didn't run into a brick wall, they just didn't get off the bus. Goff played terribly. Gurley just "didn't get his opportunities" (lol). When the Rams ran man-beater attacks or got a good route against a zone coverage, Goff just straight up missed it. The Pats offense against the Rams defense was a bit more strength-on-strength, but this was not Tom Brady at his finest. The first pass play INT was not a great defensive play, it was an absolutely terrible throw, a ball that was slow and to the inside, targeting a receiver who was (initially) open on a stop route and would have had a catch on a throw that didn't drift into the coverage instead. And this was on a quick throw in which no Rams pass rusher had broken free from the protection. If that play had happened because a pass rusher collapsed the pocket into Brady, then it would have been a great defensive play. Instead, it was just a straight up unforced error, and Brady had an un-Brady-like number of these kinds of unforced errors. Super Bowl rating hits a 10 year low. The Rams offense just didn't show up. They didn't run into a brick wall, they just didn't get off the bus. Goff played terribly. Gurley just "didn't get his opportunities" (lol). The Patriots played man coverage on 60% of their snaps, which is actually below their average, but probably high for what the Rams are used to seeing. When the Rams ran man-beater attacks or got a good route against a zone coverage, Goff just straight up missed it. I'm not going to defend Goff's throws because some of them were horrible or horribly timed (especially the almost TD pass in the end zone), but one thing that article glosses over is the pressure the Pats brought. Half those plays that look like Goff straight up missed it is because defenders were bearing down on him. That's the formula that was stumbled upon earlier in the season that appeared fixed, but clearly wasn't. Brady had a fairly sh*t game and would've been worse if the OL hadn't been setup to neutralize Suh and Donald. Without the interior pressure, there just wasn't any chance to disrupt Brady more than a few times. Dante Scarnecchia should've been MVP of the whole playoff run. Given the two teams competing, I was hoping for a scoreless tie going into overtime with lots of horrendous calls and the crowd getting ugly. Yeah I enjoyed it, but being an ex-O-lineman, I like watching good O-line schemes and the matchups at the line. The Pats' line played well and were mostly able to out-scheme what the Rams were doing. Donald and Suh were not wholly taken out of their game but were to a large extent, which is pretty amazing considering the Rams were moving them around a lot. Watching Aaron Donald play is a treat though, he just accelerates so fast. The Rams' line looked befuddled a lot of the time and the Pat's D-line also out-schemed them. Or, better put maybe, the Pats did what the teams that had success against the Rams did. The Rams just never could figure out how to block a twist stunt. The Pats had a lot of guys coming clean up the middle which threw off Goff. Added that the Rams could not seem to get anything consistent going in the running game really impacted their ability to do anything. Brady looked old and befuddled himself. The Rams secondary seemed like they were able to successfully disguise coverages and force Brady into some bad decisions. But even when he appeared to make a good read, he was either behind or short, which are not good signs for a 41 year old QB. It will be interesting to see how these teams react in the off season. Can Belichick reload once again? What can the Rams do to punch it up another notch or was this their one shot at a title? Exactly this. I have watched excellent defensive battles. Bengals announce Zac Taylor as their new head coach. Dolphins announce Brian Flores as theirs. Probably my favorite collection of takes on the quality of the Super Bowl. At least there was a chance it could have gotten better later on. It was like watching a preseason game between Eli Manning and Joe Flacco. AAF starts up this weekend. Don't forget! Is there a way to watch or stream any of it? I have a theory related to Gurley's lack of use in the past few games, assuming it wasn't injury or a character issue (I seriously doubt the latter since Gurley has been nothing but classy and team focused in postgame interviews, to his credit). McVay was under Gruden in Washington and Gruden has a doghouse. Once you're in that doghouse it's insanely difficult to get out of it. Gruden will play vastly inferior talent for entirely too long because his better talent is in the doghouse. Gurley miffed a couple passes and then went nowhere with his passes a couple weeks back. Since then, doghouse. 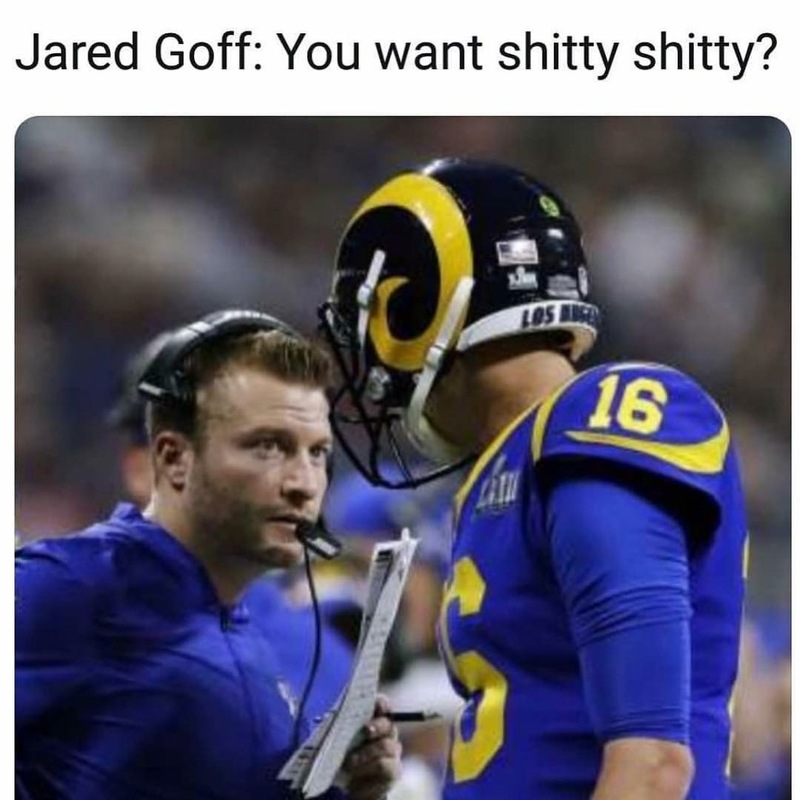 McVay: Okay, Todd. Make us proud. Gurley: For hamberders? sh*t, motherf*cker, you must be out your goddamned mind. M: ....... Yeah. I got nothing. Not gonna speak for Kraft or Belichick because F their personal politics, but I do know that Brady has shown support for the LGBT community and support of players kneeling, as well as not showing up at the WH after their last SB win. His wife says neither of them voted for Trump, but that's obviously unverifiable. Either way, doesn't really read as a white nationalism to me, for his part at least. Another coach struggling to land the coordinators he promised: the Bengals and Zac Taylor were set to interview Jack Del Rio for the defensive coordinator role, but he pulled out of consideration they mutually talked and decided it wasn't a "perfect fit".